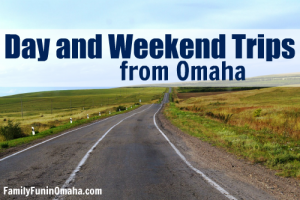 Disclosure: This post is sponsored by Cedar Fair Entertainment Company in conjunction with Blog Meets Brand, and I have been provided tickets to Worlds of Fun and compensated for my participation. All opinions are my own. Do you remember the Orient Express or Zambezi Zinger? 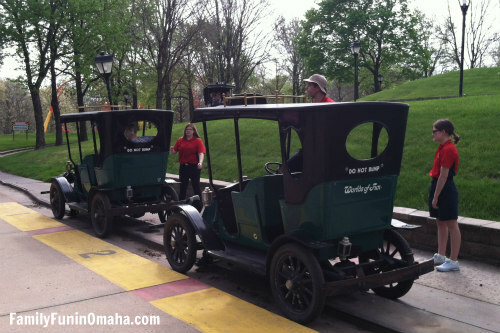 I have wonderful memories of visiting Worlds of Fun when I was younger with my family and friends, and was so excited for the opportunity to take my kids for their first visit! 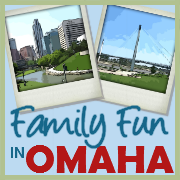 Families will also love Oceans of Fun! Here are 5 Reasons to Visit Oceans of Fun! 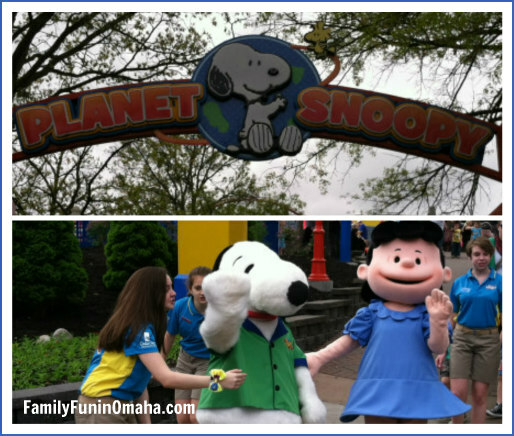 Planet Snoopy, added to Worlds of Fun in 2011, features 21 family-style rides. We could have spent the entire day in this area, enjoying the variety of rides that were fun for kids and adults. 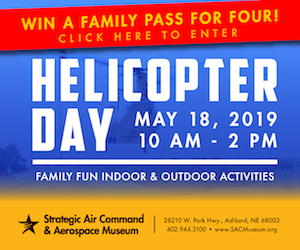 My kids’ favorite rides were Lucy’s Tugboat (one they rode over and over again), Snoopy’s Rocket Express (similar to a monorail that rode high above Planet Snoopy), and Peanuts 500 (little stock cars with a thrill at every turn). The close proximity of all the rides to each other added to the fun as the kids went from one ride to another, with the additional comfort of knowing they would be able to ride on each of them. Adults could join their kids on many of the rides, which provided a lot of excitement and fun for all ages. We even saw several adults without kids enjoying many of the rides! 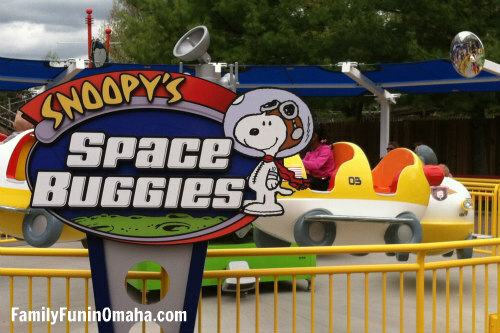 Snoopy Space Buggies – Defy gravity and bounce to the moon and back. 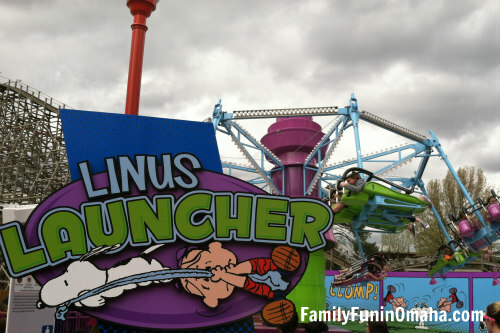 Linus Launcher – A unique ride where you lay on your stomach and experience the sensation of weightlessness through flight with feet dangling. 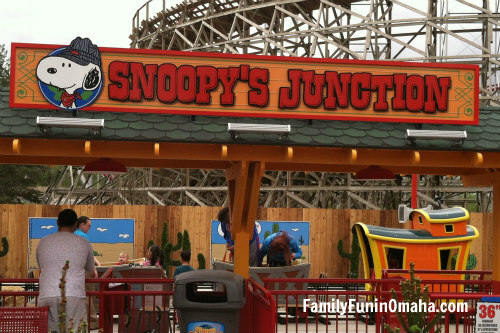 Snoopy’s Junction – All aboard! Snoopy the conductor leads kids on a railroad adventure. 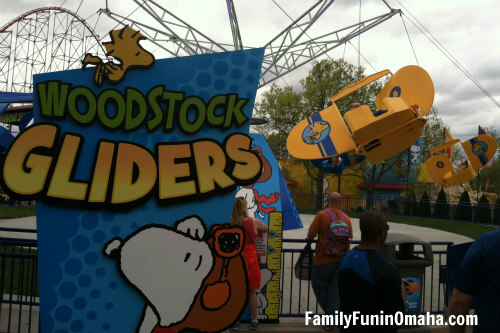 Woodstock Gliders – One of our favorite rides in the park! Guests can control their own flight with moveable wings. Woodstock Gliders – One of the new rides @worldsoffun in 2016, and one of our favorites! 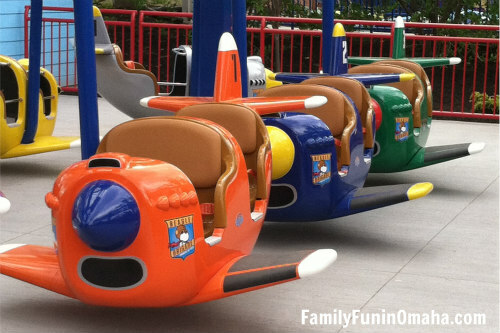 Kids can control their ride with the moveable wing! 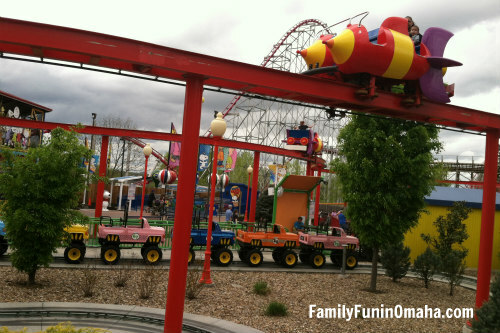 Beyond Planet Snoopy, kids can enjoy more rides throughout the park. 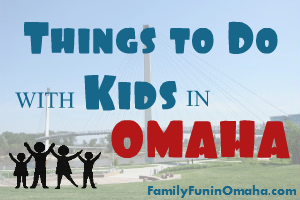 Favorites include two carousels, bumper cars, Le Taxitour, Sea Dragon (can be a little scary for younger kids), Skyliner Ferris Wheel, the Worlds of Fun Railroad, and more. Water Rides are always a family favorite including the Fury of the Nile and the Viking Voyager (log ride). Be prepared to get wet! Children 48″ and taller can begin to enjoy some of the bigger thrill rides. My daughter wanted to try the Mamba, one of five roller coasters, which was exciting, terrifying, and thrilling all rolled into one. I love that my kids are young enough to enjoy all the kiddie rides, but also are tall enough to try some of the bigger rides, if they want to. Disclosure: Lodging provided by Worlds of Fun Village. All opinions are my own. With our visit, we were invited to stay in the Worlds of Fun Village. 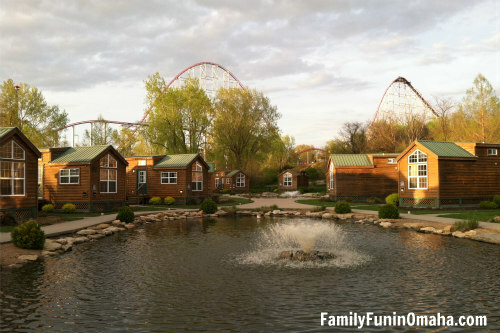 These cozy cabins provided a picturesque view of Worlds of Fun, with a kitchenette, pull out sofas, small loft area, and separate bedroom. I loved the close proximity to the park, and so we could be sure to enter right when it opened. 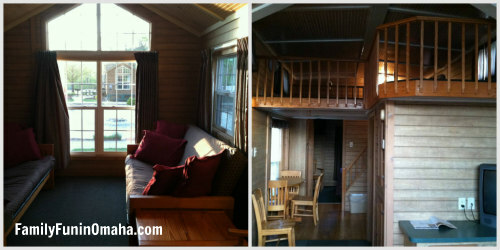 Cottages and an RV park were also available, along with a pool and hottub. 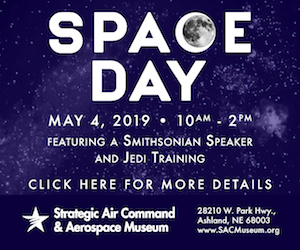 Guests can also purchase discounted admission tickets to the park. 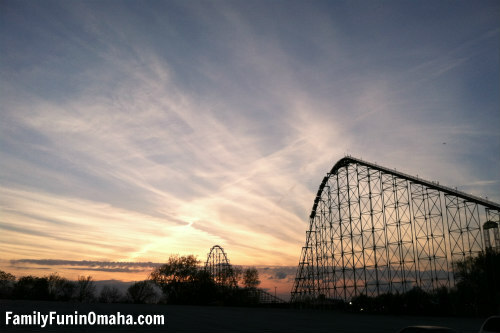 When a friend of mine lived in Omaha, she would purchase Season Passes for her family every year since they loved visiting Worlds of Fun so much. A variety of options are available. Depending on the package, you can enjoy unlimited visits, free parking, early park access, and special discounts. Find out more about Season Passes here. Find out more about Fast Passes, drink and dining deals, group tickets, and daily park passes here. The sunset on the Mamba provided the perfect ending to a great day. 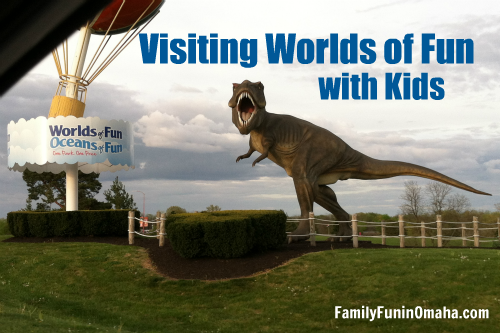 We loved bringing our kids for their first visit to Worlds of Fun and are excited to visit again! 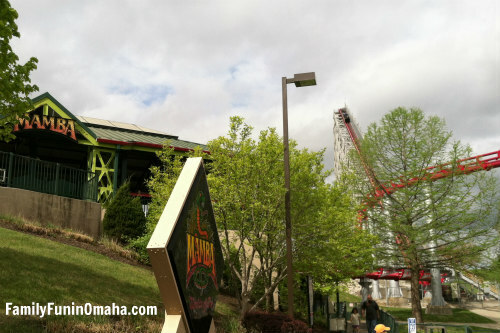 Disclosure: This post is sponsored by Cedar Fair Entertainment Company in conjunction with Blog Meets Brand, and I have been provided tickets to Worlds of Fun and compensated for my participation. Lodging provided by Worlds of Fun Village. All opinions are my own.